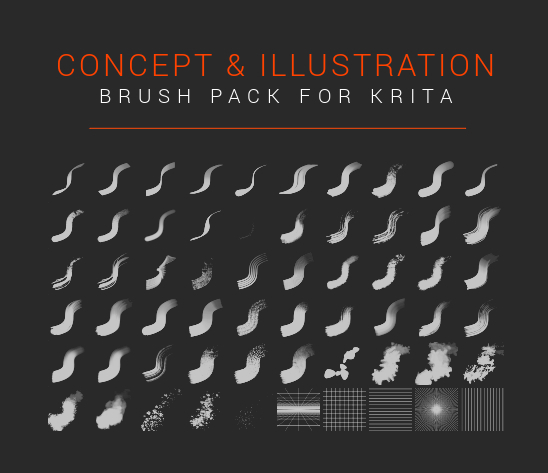 I finally got my brush pack ready for sharing. It has all the brushes I use for my work and it was specifically designed with the needs of professional Concept Art and Illustration in mind. Last edited by Pyteo on Mon Jun 20, 2016 3:08 pm, edited 3 times in total. This is gorgeous and well-made! Thanks for sharing! ramskulls wrote: This is gorgeous and well-made! Thanks for sharing! I'm aware that unfortunately people are getting the md5 error with my brush pack. I have the same problem as well. I've tried to create a new version of the bundle in Krita 2.9.7 using several methods (create the bundle from scratch, edit the bundle,etc) but nothing worked. I still get the error message. Sadly, there's nothing I can do at his point and I don't want to create all those brushes from scratch again because it took me forever. Has anyone figured out a solution for this? It just needs to be remade from scratch to be honest. You need to make sure that the paint-ops need to be copied from the resource folder and not from the bundles, afaik. Try to download the newest version of Krita from the site. This issue should be fixed now when loading bundles. The reason why your pack was having issues is because there were colon symbols in the file name. One problem is this character is not supported in filenames on Windows. The larger issue was that the colon symbol is used for internal parsing for loading these bundles that MD5 did. The latest version of Krita has the fix for this by being smarter with parsing file names. I just loaded it up and it appears to work. scottpetrovic wrote: Try to download the newest version of Krita from the site. This issue should be fixed now when loading bundles. Right now I'm having some trouble reinstalling Krita in Ubuntu, I'll post an update once I'm done. Anyway I myself could install and use the bundle file in 2.9.7.6 Windows. Thanks much for the lovely brush pack! Well, lots a work you did here! Could you share us the proper version of this bundle, please? The pack worked great for my Krita 2.9.5 on Win10x64. The brushes are super-cool, especially those with texture, so thank you very much! I have a question. Why are the buttons 'Reload' and 'Overwrite preset' disabled in the brush settings? Is it because of a bundle (other brushes work as usual)? Only a Krita restart can reset brushes to their original states. Because of that I can't reset the brush to its original size (I've set the 'Q' hot key as 'Reload preset' — very useful). I'm currently working full-time as a concept artist in Gameloft. @pyteo I tried to download the brush pack, but clicking on either of the download buttons didn't initiate a download. After digging around, I found out that it's possible you used up all your bandwidth on your box.com account for this month, which prevents people from downloading your files. Would it be possible for you to upload the files onto another site, like Dropbox or Google Drive?